The Insert Table window allows you to create one or more tables. To display this window select Insert> E-Shaped Table, Insert> Rectangular Table, Insert> Banquet Table, Insert> Head Table, Insert> Custom Table, Insert> Circular Table, Insert> Semi-Circular Table, Insert> Oval table, Insert> Serpentine Table, Insert> Row Seats or the equivalent Insert tool bar button. Name is the name of the table. The software will choose a unique name for you, but the names don't have to be unique and can be blank. Select solid, gradient or texture to choose the colour, gradient or texture of the table in the Floor Plan and Table Plan panes. This overrides any table colour set for the pane in the Fonts and colours >window. Click Default to set the table colour back to the default. Seats is the number of seats. For a circular, oval or head table or a row of seats you specify the total number of seats. For a banquet table you specify the number of seats across. For a rectangular table you specify the number of seats across and the number of seats down. 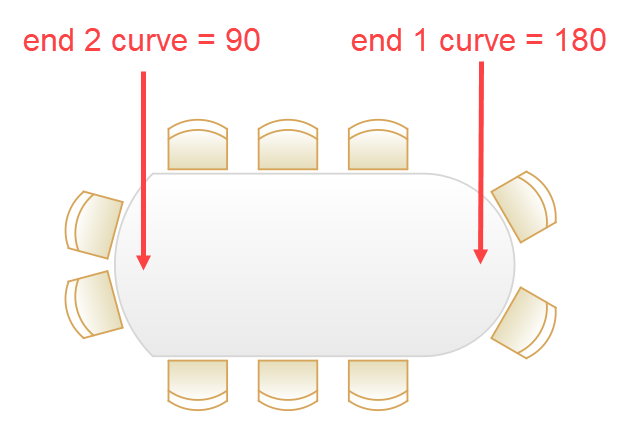 For a semi-circular table you specify the number of seats across and around. For a custom or serpentine table you specify the number of seats on each of the 4 sides. Create can be used to create more than one table at a time. The text alongside tells you how many seats will be available after the new tables have been created. Note The new table(s) will be placed automatically in the Floor Plan pane. It will attempt to place them in spaces near the centre of the room. You can then drag them to the appropriate position. You can change any of the table properties (including the name and shape) at a later point using the Table Properties window.